A man and his child walk through a crowded site for internally displaced people in the Central African Republic capital, Bangui, where many people remain at risk. As the violence across the Central African Republic (CAR) continues unabated, United Nations agencies are sounding the alarm about the plight of civilians at risk inside the country and are now also warning that the crisis threatens to engulf the region, with thousands of people fleeing the fighting to seek refuge in neighbouring countries. Since December 2012, violence and instability have displaced more than 700,000 people inside CAR and forced over 288,000 to flee to neighbouring Cameroon, Chad, the Democratic Republic of Congo and the Republic of Congo. The World Food Programme (WFP) warned that neighbouring countries are struggling to cope with the more than 150,000 new arrivals in urgent need of assistance. “We are facing a regional crisis that goes well beyond the borders of the Central African Republic. These people – most of them women and children – have seen their homes burned and witnessed unspeakable violence and had no choice but to leave,” said Denise Brown, WFP’s West Africa Regional Director. According to WFP, the exodus from CAR into fragile and food-insecure areas has intensified since December 2013, creating new strains on local communities. Many of the surrounding countries are already hosting large numbers of refugees from various countries and resources are stretched. WFP said it is concerned it cannot meet the needs of these extremely vulnerable people because of insufficient funding. The conflict in CAR erupted when mainly Muslim Séléka rebels launched attacks in December 2012 and has taken on increasingly sectarian overtones as mainly Christian militias known as anti-Balaka (anti-machete) have taken up arms. Thousands of people are believed to have been killed, and 2.2 million, about half the population, need humanitarian aid. The UN High Commissioner for Refugees (UNHCR) reported that more than 15,000 people in 18 locations in the north-west and south-west of the country are at present surrounded and being threatened by armed groups. Highlighting reports of recent attacks, Mr. Edwards said UNHCR and its partners are responding to these situations through protection-by-presence, humanitarian assistance, advocacy for protection measures and in exceptional cases, through facilitating the movement of these communities to safe sites. 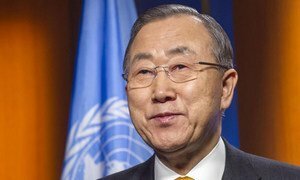 Last week Secretary-General Ban Ki-moon put forward a six-point initiative for addressing the most urgent priorities and needs in CAR, including more troops and police, increased efforts for the peace process, support for the Government, funding for humanitarian assistance and accountability. United Nations Secretary-General Ban Ki-moon has again taken to the airwaves to deliver a personal appeal to the people of strife-riven Central African Republic (CAR) to lay down their weapons, come together, and end the spiralling bloodshed and inter-communal violence that has plagued the country for months on end.